I've yet to quench my thirst for edgier and more statement type shoes. I've probably overindulged in plain and comfy shoes that blend into the background, the way I do at parties. Don't get me wrong, comfort is still the paramount factor when I'm choosing footwear but I love quirky details like the strap in the shape of a lightning bolt on these Ancient Greek sandals or their bright red slip ons. They're similar to the K.Jacques sandals that I own but far more affordable and innovative. Why go for plain canvas espadrilles when you can have zebra stripes (taking the love of all things breton to my feet). Valentino lace espadrilles are the current rage in the fashion world but sadly, the price point is way WAY above my budget but these Zara ones are just as gorgeous at a mere £39.99. 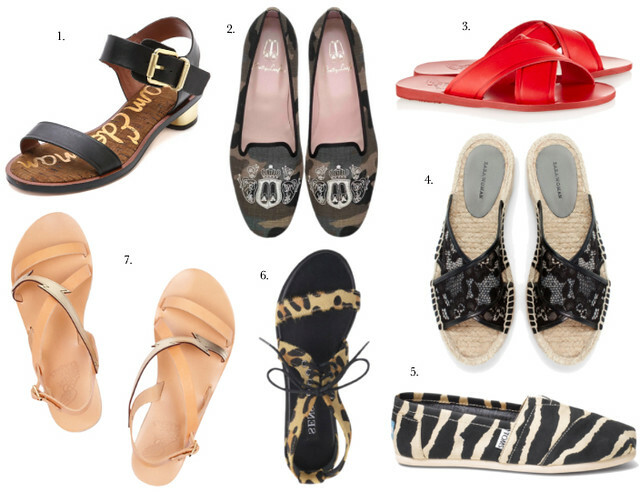 I know I've talked about these Senso leopard print Fifi sandals but they need another mention. I find myself reaching for my leopard print flats more often than any other shoes. Since the camo print is regarded as a neutral, why not add an eye-catching coat of arms embroidery? Okay, officially the Sam Edelman Trinas aren't considered statement shoes but they are by far, the most comfortable and versatile sandals out there in the market. You've got well cushioned insoles and the low chunky heels are far more comfortable than flats especially if you have a higher arch and are on your feet all day. I love my neutral ones but I'm planning to get a pair in black as well. By the way, if you're living in the UK and know your size, do consider purchasing the Trinas from Nordstrom. They work out £40 cheaper even with the shipping and duty. I love the TOM espadrilles - the print is so unique and really eye-catching. I especially love the Ancient Greek tan/silver ones...but sadly, my only summer sandal purchase is going to be a pair of Birkenstock Gizehs. Here's hoping they don't look like cement bricks on my feet! I really need a pair of sandals for the summer, thank you for the inspiration. I gravitate towards simple brown or white leather sandals, but another option I like for the summer is these new d'orsay type of flats that have been popping everywhere!